If you’ve ever searched the Internet for the best meal prep storage containers for meal prep, you are probably feeling pretty overwhelmed at this point, aren’t you? But don’t worry! In this guide, we’re going to share with you how to select the right storage containers for your needs. Do you have a preference for glass or plastic? Reheating in the microwave oven, portability? Do you plan on storing meals ahead of time or just separate cooked foods? Divided containers, multiple container, or simple containers? What types of foods will you be storing? Solids, liquids, raw veggies, meats, etc.? Will you be transporting your stored food? Going to the office or staying at home? How long do you want to keep your containers for? A single use, years, a lifetime? When reading this guide, you will want to keep your answers in mind. When storing foods, you will have a much easier time using containers made specifically for food storage rather than aluminum foil or plastic wrap. Plus, they will store food for longer. The sheer volume of storage containers available today is huge. 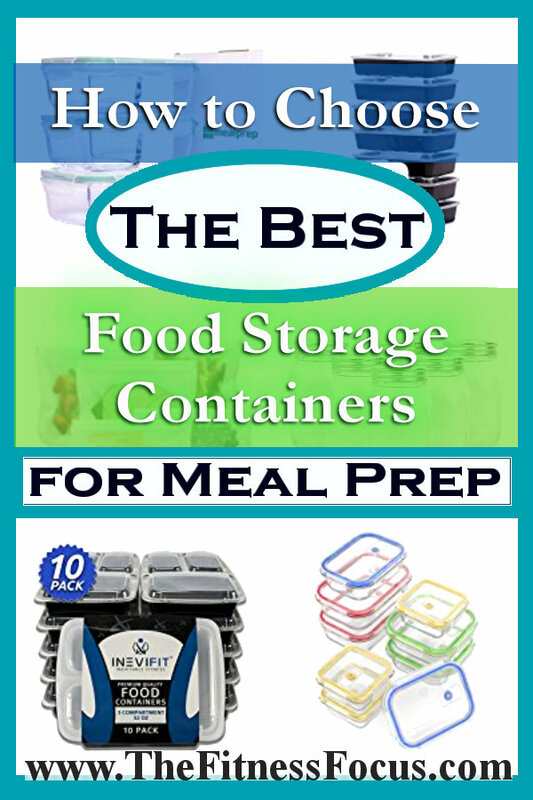 Here are the three main types of food storage containers for meal prep. You might be thinking tupperware first (which works), but today companies produce specifically designed plastic containers for meal prep. Pros of plastic: lightweight, can be divided, sometimes reusable, and mostly microwavable. If you will be transporting your food any type of distance, say to work, plastic containers are much easier to carry around. Cons: plastic containers will not last as long as others like glass or if chemicals in plastic concern you. If you are worried about BPA, which may be an endocrine (hormone) disruptor, there is good news. The FDA highly regulates food storage containers, and you will be hard pressed to actually find anything plastic containing this, but I would double check to be sure. 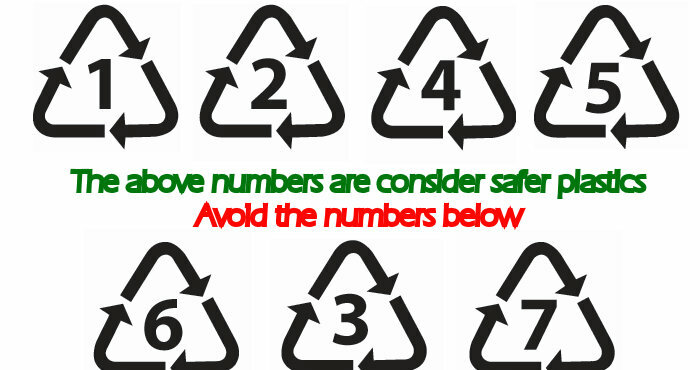 Here are plastic safety numbers (the number inside the recycling symbol) and what to look out for. Pyrex, likely comes to mind in this category. But again, meal and food storage has become a huge market. Today there are all sorts of specially made glass containers, plus others like mason jars that work well, too. Pros: often airtight containers that are microwavable, dishwasher safe, and will last many years. Cons: glass is very heavy compared to their plastic counterparts, but also breakable if you are not careful. The good old plastic bag. Don’t count these out. We have food storage bags made from silicone that can be microwaved, frozen, are dishwasher safe, and can be reused! You just need to be careful and look for quality bags if you want them to last. How Long Will Food Stay Fresh in Containers? We had to refer to the USDA for this section and have to say there is a lot to keep in mind about food safety. Airtight containers are going to best for limiting the bacteria growth that can occur and spread through the air. Cooked foods should go directly into the refrigerator once separated for storage when finished cooking to prevent bacteria growth. For meals that includes cooked meats, 3 to 4 days of refrigeration time is about as long as you will want to go before spoilage can set in. For strictly vegetarian meals, the time-frame can be extended a couple more days. What About Using the 21 Day Fix Containers for Storage? Since I write a lot about the 21 Day Fix and other Beachbody workout programs, I know I am probably going to get this question. No, I would not recommend using the 21 Day Fix containers for food storage. They are not airtight, can leak, and were just not designed for food storage. They were made to portion out the correct serving size of their corresponding food group. Now with that said, sometimes you can get away with storing some items with them short-term, but for long term storage, I would go with containers that are designed specifically for food storage, which we’ll take a look at next. If you are meal prepping for more than one person, purchase different colored tops for containers so you know whose is whose. Most containers are dishwasher and microwave safe. If you will be reheating in the oven or freezing meals, make sure the containers are rated for this. If you are concerned about bacteria growth, anchor hooking tops for containers provide an airtight seal and also provide leak protection These are typically only available with glass containers. Whether using plastic or glass containers, be sure to remove or vent the lids when microwaving. Glass will typically clean easier than plastic containers. Plastic containers are more apt to stain from certain foods. Glass containers will be much heavier than plastic, something to keep in mind if you’ll be traveling. If you are not going to be storing your food all the same way, you may want to order a couple different types of containers. Then you can figure out works best for you. This type of container is best when you’re making a basic three-course meal. You can put your lean meat in one section, a healthy carb in another, and a vegetable in another section. When selecting a 3-compartment plastic meal storage container, opt for bpa free, microwaveable, dishwasher safe. None of the containers we looked at were leak proof, but we did find a coupe leak-resistant containers that are linked to below. 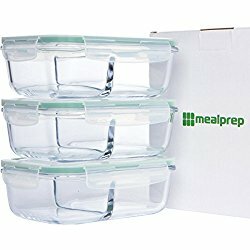 The glass meal prep containers with dividers. Glass is pretty much safe to do anything with: microwave, bake, just don’t drop them.! The downside of these is they’re going to be heavier than their plastic counterpart. 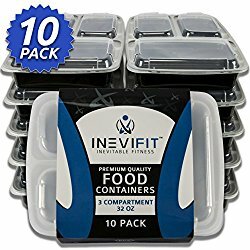 The best selling plastic meal storage container on Amazon is the LIFT by Evolutionize. This is a BPA-free reusable container that is microwave safe, dishwasher safe, and freezer safe. This is a one-compartment 28 oz container, which is a great size. These containers are manufactured in Canada and are toxin-free, BPA-free, phthalate-free, and free of toxic additives. Completely compliant with strict FDA (US) and CFIA (Canada) guidelines. 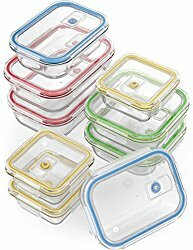 I’ve always recommended glass containers meal prep storage containers for safety even though there is nothing wrong with quality plastic. With glass containers, you’ll be able to use them for a very long time, over and over again. You don’t ever have to worry about any chemicals coming into contact with your food or staining. The only downside I see to glass containers is they can be heavy – and they’re breakable. Before transitioning to full-time coaching and blogging, I had a two-block walk into the office with 2 flights of stairs. Carrying my lunchbag with three glass containers for the day was a workout on its own. There are a lot of quality glass storage containers to choose from. The best selling VREMI 18 piece set(containers + lids) is the one I’m going to share below, because it has a nice selection of different size containers and colors. I have also been very satisfied with my Glasslock set, but it is currently unavailable. Not just for canning, mason jars are a great tool for meal prepped food storage. You have to be careful though, because they’re not the best for everything. But then again, the containers above are not that great for some of the foods mason jars are perfect for. 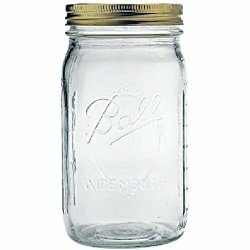 Mason jars come in a variety of sizes: 4 oz, 8 oz, 16 oz, all the way up to one gallon. The size you’ll need depends on what you’ll be prepping, but I find the 8oz and 16oz work best. While you can always use ZipLock bags for storage, there are also reusable bags made from silicone that in the long run, are more than worth the higher upfront cost. These are perfect for small snacks and sandwiches. I hope you found this post insightful. 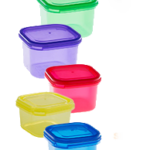 I did not want to just list the highest rated meal prep storage containers without adding in some tips about which ones are better for different circumstances. Hopefully this guide will help you choose the best containers for your needs. 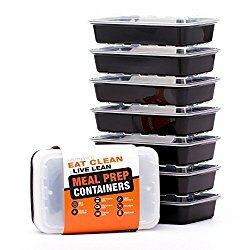 Is there any way to avoid having two different sets of containers when using the 21 day fix? Such as one to measure the amount/portion control and then a different set of containers to store. Do you know of, or recommend a set of containers that can accomplish both needs?